Belgium, Switzerland and France may be most renowned for fine chocolates, but American artisans are rapidly becoming competitive in this sweet industry. 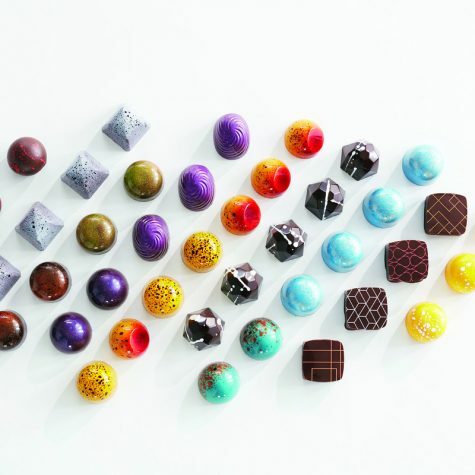 Like most of their European counterparts, these stateside chocolatiers are passionate about their craft, insisting on preserving an art that is too often compromised by conglomerates reaching mass markets. 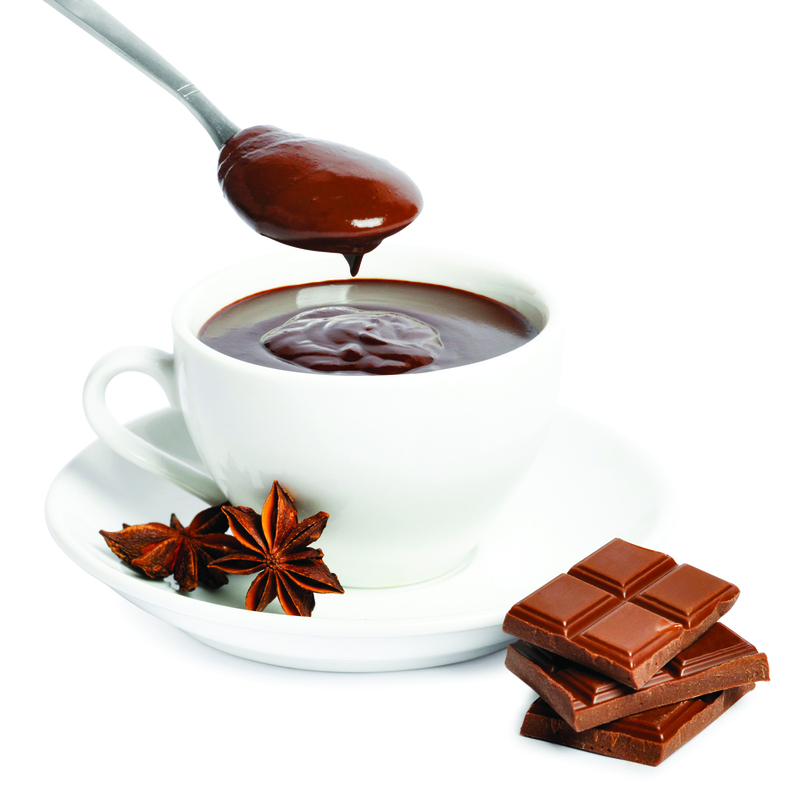 Chocolate is a big industry, encompassing baking chocolates, bars and confections of all kinds. 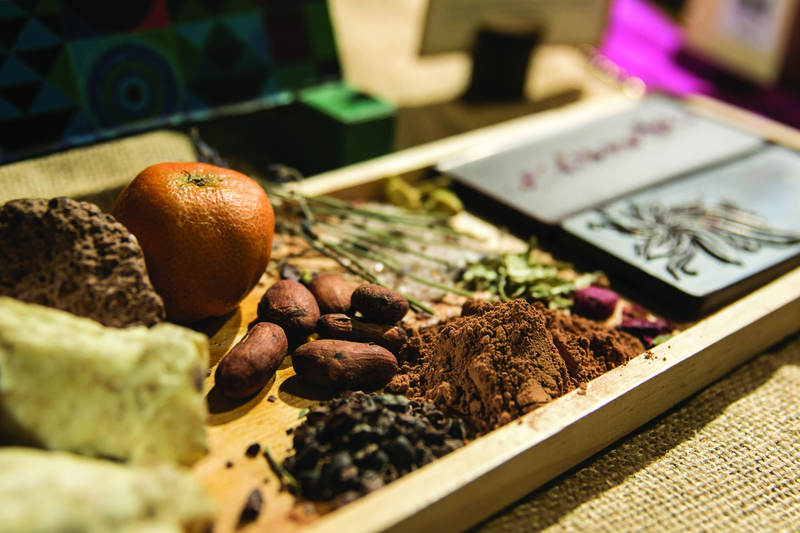 The power of chocolate can be fully appreciated at Salon du Chocolat, a trade show held in a cavernous convention hall in Paris every fall. There, celebrity chocolatiers demonstrate their techniques, while chocolate sculptures and even a fashion show — models hitting the runway in dresses created entirely of chocolate — entertain guests. 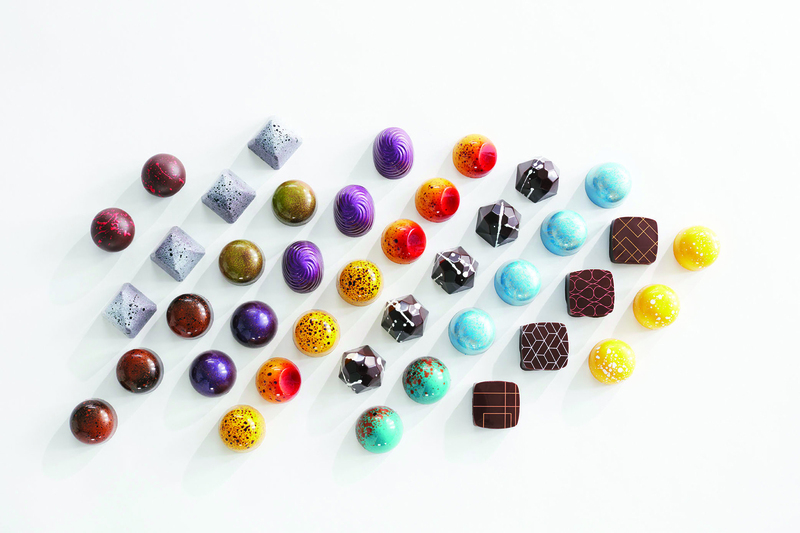 The exploration of chocolate presented herein focuses primarily on boxed chocolates or bonbons — arguably the most elegant niche in the industry — in which an endless variety of fillings are “enrobed” ina thin layer of chocolate. 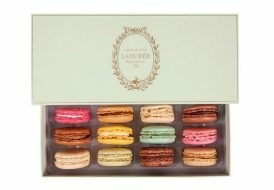 Prominent European brands include Teuscher (Zurich), La Maison du Chocolat (Paris), Puccini Bomboni (Amsterdam), and the more mass market-oriented Godiva (Brussels). 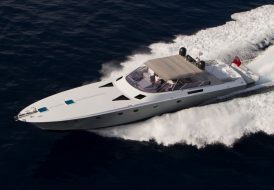 American artisans, however, are in hot pursuit. 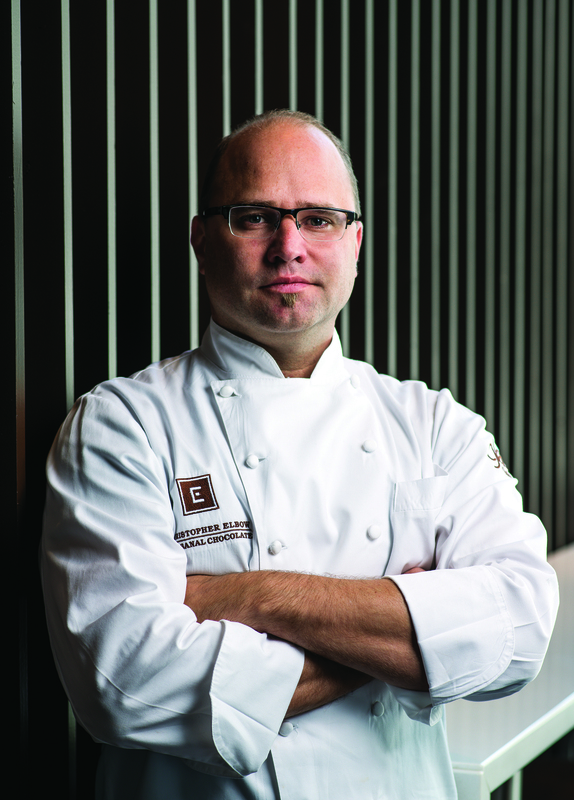 The Heartland may not be the first place one expects to find world-class European-style chocolates, but self-taught chocolatier Christopher Elbow is earning a global following from his home in Kansas City. 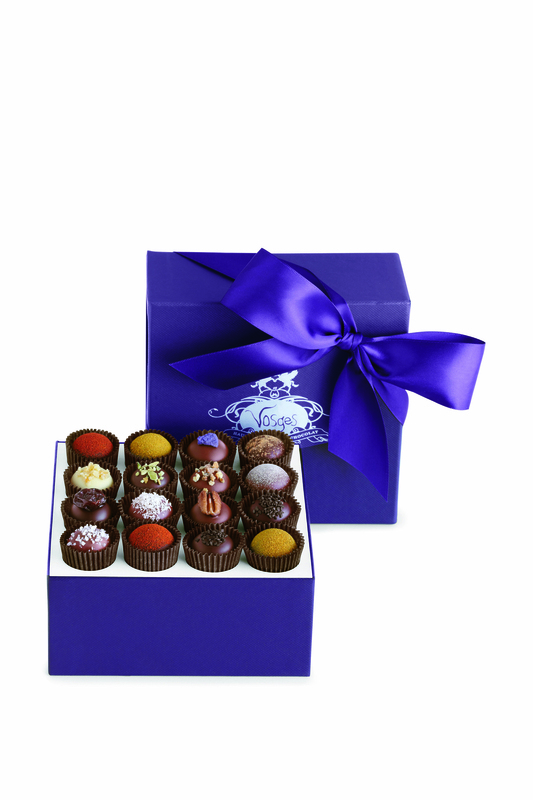 The artisan/entrepreneur, who also maintains a boutique in San Francisco, creates boxed chocolates that are refined and classically inspired, but also a bit showy, a quality he may have adopted while working as a pastry chef at some top Las Vegas hotels. Elbow is inspired by traditional chocolatemaking techniques from Belgium, Switzerland and France, and was influenced as well by San Francisco’s Michael Recchiuti. The chocolatier explains, “We stick to that traditional craftsmanship, but add a more modern spin with colors and flavors not typically associated with chocolate.” Color was the element that initially fueled Elbow’s passion for chocolate making, and he consistently applies vibrant hues through techniques like airbrushing, sponging or Jackson Pollock-style splashing. “We have a lot of different tools we use, acquired at art stores or Home Depot,” quips the chocolatier, who insists the color is dictated by what lies inside. When addressing the dilemma of balancing aesthetics against flavor, Elbow reports, “Flavor always wins … Nobody cares what a piece looks like if it doesn’t taste great.” While clearly a modernist, Elbow continues to admire traditional practices, noting, “Lately we’ve been revisiting the classics — timeless combinations like fleur de sel-caramel or chocolate-hazelnut — and seeing how we can put our own modern spin on them.” Despite their showy exteriors, most of Elbow’s compositions are relatively simple, without multiple flavors squeezed into a single piece. “Sometimes using fewer ingredients is more challenging because there’s nothing to hide behind,” suggests Elbow. A Le Cordon Bleu-trained chef who apprenticed with cutting-edge Spanish toque Ferran Adrià at El Bulli, Katrina Markoff is a genuine chocolate pioneer, and since launching Vosges Haut-Chocolat in 1998, she has never stopped breaking new ground. 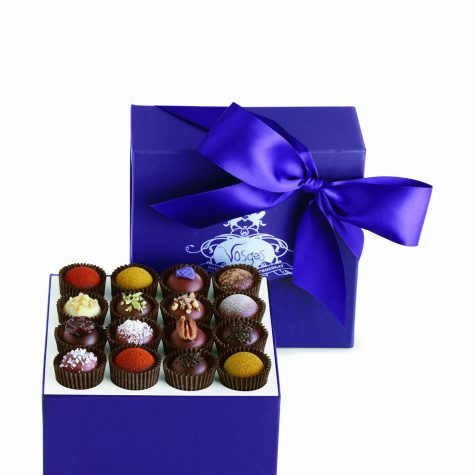 Her Chicago and New York boutiques offer a remarkable diversity of elegantly wrapped bonbons and truffles infused with flavors inspired by Markoff’s journeys around the world. Curry powder, olive oil, wasabi, and rose water are among the eclectic ingredients that transform her chocolates. Explaining her inspiration for the brand, Markoff recounts, “I just couldn’t find quality highend chocolate with natural ingredients and no preservatives,” while bemoaning the lack of imaginative flavors. “At first people thought it was disgusting and I had to convince them to try it,” says Markoff of her use of chiles and spices in her early work, but reports the culinary media embraced her concepts. Conceding her presentation qualities are relatively staid compared to her flavoring, the innovative chocolatier explains she relies on the spices to provide colorful accents naturally. 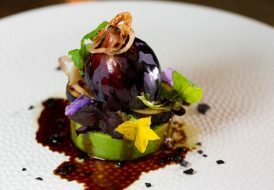 With exotic chiles and spices now ubiquitous in the chocolate world, Markoff continues to push the envelope, exploring flavors such as mushrooms, a Peruvian ginseng-like ingredient called maca or pine pollen. Los Angeles has emerged as a hotbed for artisanal chocolate making, and Valerie Confections specializes in a range of boxed chocolates, bars and petit fours. They are not as aesthetically flashy as others, but exhibit an honest sense of classicism. “My approach is fairly uncomplicated … I like timelessness in all aspects of the craft, so from flavor profiles to ribbed boxes I look for something that feels perennial,” reports founder Valerie Gordon. “The presentation of a box of chocolates or the finish of a cake must leave a lasting impression on the recipient. They should feel a giddy anticipation before untying a bow or cutting that first slice,” adds the self-taught Gordon. While understated, the boxed chocolates from Valerie Confections do not lack imagination. A collection of Smoke & Spice truffles, infused with chiles and finished with paprika, were inspired by Gordon’s visit to a spice merchant. “I fell in love with the Hungarian smoked paprika and wanted a vehicle to showcase it,” she explains. 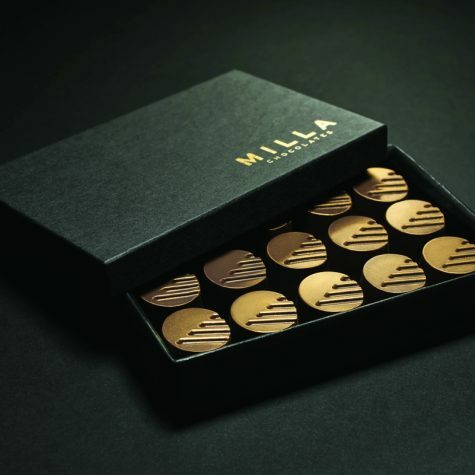 A more recent brand shaking up L.A. is Milla Chocolates, where founder Christine Sarioz insists on handcrafting everything that leaves her kitchen. Yet another self-taught chocolatier consistently winning prestigious awards, Sarioz spent several years in research and development before offering her products to the public, appreciating just how delicate and temperamental a medium chocolate can be. The proprietor, who has a background in fine art, has created an elegant, modern aesthetic for her singleorigin Dominican or Venezuelan chocolate ganache bonbons, which may feature subtly gilded surfaces, but never appear fussy. “I really enjoy creating minimalist architectural forms, which are consistent with my approach,” explains Sarioz. “Even the packages are wrapped and tied manually … I like to have my hands in everything,” reports the entrepreneur, whose passion and dedication are clearly evident. 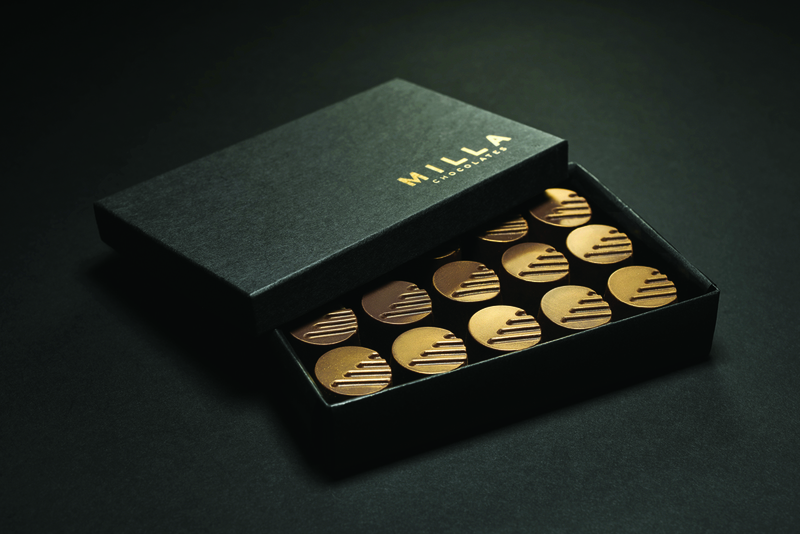 For Milla’s Kir Royale bonbons, each piece is ingeniously infused with flavors that evoke the iconic Parisian cocktail for which the confection is named: brut, Marc de Champagne, crème de cassis, and blackcurrant. Milla Chocolates’ first brick-and-mortar store, complete with exhibition kitchen, has just opened in the L.A. community of Culver City. A tribute to her family’s Indian culture, Malhotra tops a shimmering dome of masala chaiinfused milk chocolate ganache with Harney & Sons Ceylon black tea for both texture and flavor. The chef, who worked for famed sushi chef Masaharu Morimoto after culinary school, shows her appreciation for Japanese flavors in yellow-green swirled truffles flavored with yuzu and sake. Her use of other spirits led to the introduction of a boozy collection called “The Chocolate Bar,” consisting of pieces infused with everything from beer to bourbon. 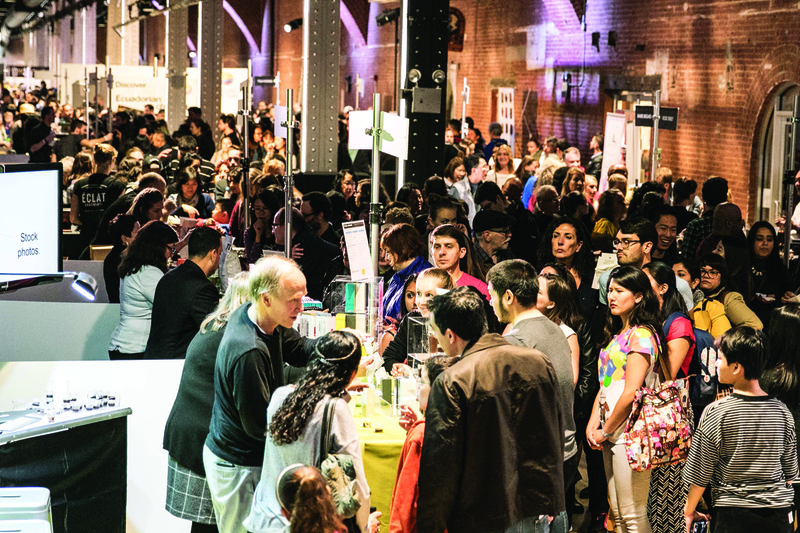 Every September, The Big Chocolate Show convenes in New York City, where 7,500 chocolatiers, pastry chefs, food writers and editors, restaurateurs, and retailers discover new industry trends and emerging stars. All things chocolate are celebrated here, from bonbons to cocktails. Jenny McCoy, who previously prepared plated desserts for celebrity chefs Charlie Trotter, Tom Colicchio and Emeril Lagasse, is director of programming at The Big Chocolate Show. 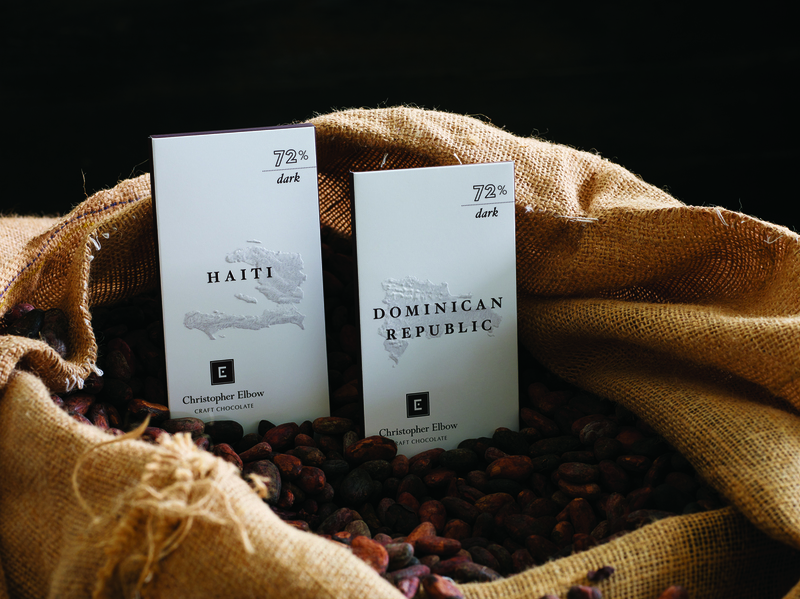 “It gives small artisan chocolate makers a platform to show what they’re doing and expand their brand,” says McCoy, who reports the event is also a great place to stay abreast of new developments in the industry, such as chocolate sweetened with natural sugar alternatives or high tech 3D-printed chocolate. Matt Frederick, who launched his line of chocolates at The Show last year, found the exposure extremely beneficial for his Atlantic Confectionery Company. “Everything we make has a judicious pinch of Atlantic sea salt to balance and enhance flavors,” says the New York-based chocolatier, whose background is in savory cooking. At his debut at The Big Chocolate Show, Frederick won an audience award for his Atlantic sea salt caramels, boosting the reputation of his young company. “I’ve worked in artisanal food for most of my life and I want my daily treats and special occasion gifts to reflect today’s more enlightened ways of eating,” says the entrepreneur, whose packaging is elegant yet recyclable. 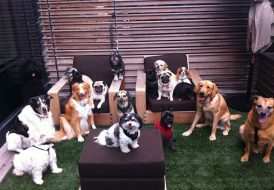 This story originally appeared in Homes & Estates magazine.